EAW015502 ENGLAND (1948). Billingley, Open Cast Coal Quarry south of the village, 1948. This image has been produced from a print marked by Aerofilms Ltd for photo editing. 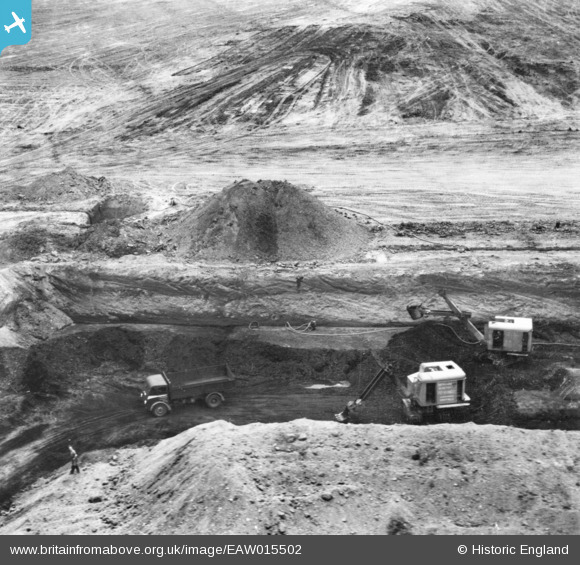 Pennawd [EAW015502] Billingley, Open Cast Coal Quarry south of the village, 1948. This image has been produced from a print marked by Aerofilms Ltd for photo editing. The bottom word here looks to be Sheffield. Like your work on this. I note that there are a few LIMA excavators at work. Also, in one of two of this set it is just possible that the top layers have been stripped away and then a dark layer (coal?) is being loaded into small lorry/lorries. Is it possibly an open-cast coal site? I think it says "Smith Excavator", then lower down Thos.W.Ward, Albion Works, Sheffield. EAW015495 covers the same area.